Now that Junior, Sulley and I seem to have finally found that “balance” in their raw diet, I have been on a quest to find sources of healthy, all natural treats and chews for them to complement their raw diet. My standards for treats and chews has risen to the point that I am finding it difficult to source not only healthy options, but options that are appropriate in both size and strength for a giant breed dog. Not an easy task. Raw Paws Pet Food was a name that I kept seeing in raw feeding circles, so I reached out to them for information on their treats and chews. They offered to send me a bag of their all natural beef esophagus for Sulley and Junior to try in exchange for an honest review. 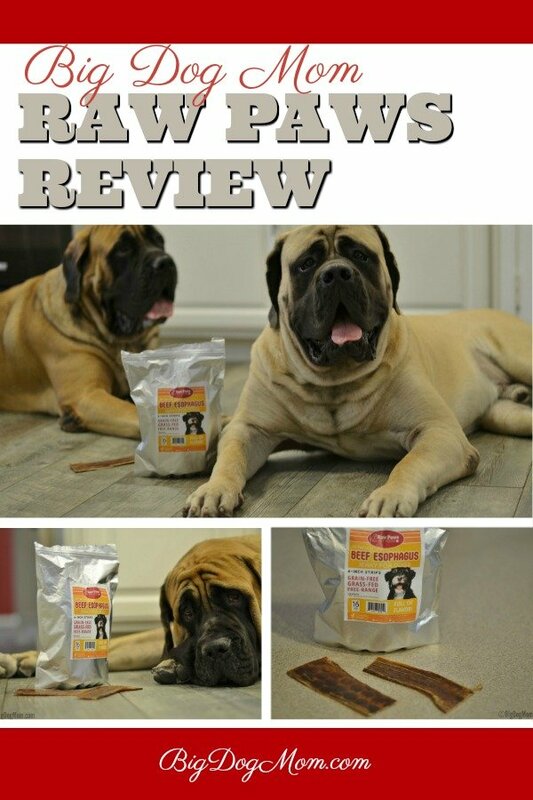 Raw Paws Pet Food sent me a bag of beef esophagus jerky chews in exchange for my honest review. In this post there are affiliate links from which I may receive a small compensation. There is NO ADDED COST to you should you use these links. Thank you very much for your support! In business since 2014, Raw Paws Pet Food’s mission is to make raw feeding practical, affordable, and accessible for you, as a pet parent, to provide your dog or cat with the healthiest pet food, treats, chews, and supplements. And something that is very important to me, Raw Paws sources their food from responsible and ethical farms in order to deliver the highest quality products made with the freshest ingredients! I received a 16 oz bag of 6” long 100% natural beef esophagus jerky strips for the boys to try. These treats are sourced from grass fed, free range beef and they contain no grains or by-products. 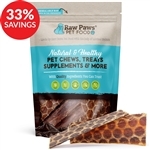 According to Raw Paws, these all-natural treats are packed with essential vitamins and minerals which makes them ideal for improving oral and joint health. And, particularly important for us big dog folk, each esophagus strip is naturally rich in glucosamine and chondroitin, which may reduce inflammation and improve your dog’s joint function. As a general rule, given Sulley and Junior’s size, I am cautious about feeding any kind of chew that is less than 10-12” long due to the potential choking hazard. That said, I found these jerky treats just chewy enough to last for more than 2 seconds (very important), yet able to be crunched into smaller pieces for safe swallowing. Secondly, they were fairly clean even when chewed up. With the exception of the white slobbery froth around Junior’s and Sulley’s mouth, these chews did not make a huge mess like some other chews I have tried. The last thing I will say about these chews is that, while I believe durability and cleanliness are important, the most important review is the one from Junior and Sulley. The day I received these treats, I had the brilliant idea to use them in what I had hoped would be a better quality video for my post The Ultimate Guide To Cutting Dog Nails And Having Them Love You For It. In the end, it took me 4 attempts on 2 separate days to get a video that just might be considered an improvement over the videos that are on that nail cutting post. I put this reel of outtakes together to give you a sense for Junior’s and Sulley’s reaction to Raw Paws treats. I will let the video speak for itself. 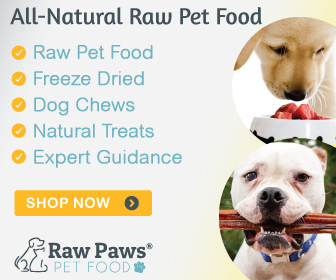 If you are a raw feeder, a partial raw feeder, or just looking for heathy alternatives in the food, treats and chews you feed your big dog, I encourage you to check out Raw Paws Pet Food. Save Up To 35% – Shop Sale Items! Save 10% On All Orders! Use code RAWTAKE10. I was giggling away watching those outtakes. I can’t do a damn thing with treats if Delilah is not locked up! It doesn’t matter what type of treat I’m using, if there is food, the Lab is there.